Mommy Wars – Has There Been a Cease Fire? Recently I heard something very gratifying on NPR – according to a recent Harvard research study, daughters of those moms we used to call “working moms” are more successful professionally than daughters of those moms we used to call “stay at home moms” – and their sons are more conscientious. FINALLY vindication for those of us who pioneered as career women against most all odds! Hearing about this research got me thinking about days past (something I enjoying doing for this blog) and the saga of the St. Something Afterschool Program. (I changed the name to protect the innocent). Back in the early 90s my daughter attended a small Catholic grade school from 8:00 am until 2:30 pm. The school was in a “gentrified” urban neighborhood. The church was considered quite liberal in the day – offering social groups for not only oldsters and youngsters but even divorced and gay Catholics. Over time a group of us “working moms” began to chat about the hassle of finding daycare for our grade-schoolers. As action oriented gals, we decided to get together to develop an after-school program at the school. Our idea was to create a fun and enriching program primarily for those kids who needed daycare until their parents got off work. Our afterschool “committee” consisted of a physician, a lawyer, a marketing executive, an accountant and a computer specialist. Our “war room” was my dining table where we gathered in the evenings, drank wine, munched on cheese and crackers and attacked our project with the same zeal we mustered when working at our respective downtown offices. A month or so after we began, we finished a business plan document – and it was damn good if I say so myself. It addressed financial, operational, educational and regulatory concerns. Had it been an investment opportunity, no doubt we would have attracted lots of capital! We described a self-supporting afterschool program open from 2:30 pm to 6:00 pm offering fun, safe and learning activities for the kids and convenience for their working parents. We were STOKED and couldn’t wait to take our bows once the Pastor and Parish Council finished clapping. Naively we asked to present our proposal and obtain permission to proceed. Unbeknownst to us, battle lines were being drawn and delay tactics immediately began. “The Parish Council has a full agenda . . . the Pastor will be on vacation . . . out of town . . . out to lunch . . . in the confessional . . . saying the rosary . . . otherwise indisposed . . . thinking pure thoughts . . .” (you name it). Time to re-group and strategize. We decided to meet one-on-one with the parish power brokers to see what gives. The self-appointed Grand Poo-bah was a woman who had been a successful bank executive until her first child was born. She then used her executive talents to control the Pastor, the Parish Council and all other things “St. Something”. She was smug in her self-righteousness and overall a pain in the pitooty. When she finally deemed to meet with our appointed spokesperson, she explained that she understood our desire for an afterschool program, but that she and the other stay-at-home moms had met and decided to torpedo the afterschool program proposal because (get this) they did not want to encourage parish mothers to have careers – particularly since they had all given up their careers to foster “the best interest” of their children. As strong as our working mom group liked to appear, her words were like a dagger to our hearts. 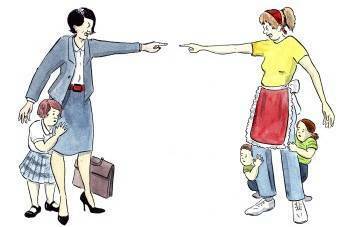 In those days as pioneer career moms, we had ambivalent feelings about leaving our children during the workday. We were in unchartered waters and clearly didn’t want to harm or disadvantage our children. Those were tuff and somewhat lonely times for working moms. Used to setbacks in our careers, we quickly moved to plan B – modifying the business plan to include a modest profit on operations and meeting with ancillary power-brokers and other working mom families. With the backing of a large group of the former, who also just happened to be generous donors to the parish, we were able to be added to the agenda of the next parish council meeting and get approval to proceed with developing an afterschool program. The afterschool program opened the next semester and it thrived and to this day is one of the school’s most effective recruiting tools. One of the biggest ironies was that the Grand Poo-bah actually signed her own kids up for the program. It turned out that the working mom’s kids liked it so much that the stay-at-home moms had to sign up their own kids (at least a couple days a week) so as not to miss out on all the fun! By the way, I shouldn’t brag – but back to the research about daughters of working moms doing well – I can attest to the fact that my daughter and her friends, whose mothers also worked outside the home, each appears to be doing well – one is a veterinarian, one is a non-profit executive and one is a lawyer/activist. All three (now 30-year-old women) are professionally successful, contributing members of society, and seemingly happy in life. Has There Been a Cease Fire? According to a 2013 Parents Magazine survey, 63% of moms believe mommy wars still exist but only 29% have ever experienced the impact first-hand. That said, when the author of the magazine article googled “mommy wars”, she noted nearly 25 million results! So, whether the war still exists or not, there continues to be lots of buzz about it. Once again I return to the “choice” theme of my blog musings. We boomer feminists worked long and hard to create choices for women and to ensure these same choices for our daughters. I know many young women, including my nieces and young women attorneys with whom I work, who continue to struggle with doing the right thing for their children and for themselves. At least now they will have the benefit of the referenced research study to know that their work outside the home will not harm and will actually help their daughters. The choice to work at home or outside the home is not easy and it is very individual. We should celebrate the choice and not judge our sisters for their choices. Last, but not least, I hope you enjoy this post’s song, Although this parody does not address mommy wars per se, it is a very fun music video and makes some great points about working women. MOTHERHOOD – To Be or Not To Be? It’s time to talk about babies – having them or not and if so, how many? Why having none is “selfish”, having one is “unfortunate for the only child” and having two or three is “just right”. “gotta love the 4-legged kids – love my 4-legged granddog and cat.” She went on to tell me how hard it is to hear reactions to her no kids stance such as, “don’t worry, honey, you’ll change your mind once your biological clock starts booming”. Her ready response to which – “I had uterine cancer”. Her reply quickly shuts down the kid conversation causing the perception of her to go from selfish to victim. She then quips that cancer had nothing to do with her decision to forego motherhood. She told me she never did and doesn’t now want kids and she’s sick and tired of being judged negatively for her decision. This discussion got me thinking about women’s childbearing choices or lack thereof. I just finished reading a very interesting historical fiction called, “The Invention of Wings”. It’s about the Grimke sisters who were abolitionists from the south in the early 19th century. The novel elegantly depicts a time when certain women had no choice but to marry to leave their parents’ home – they needed husbands to take care of them because they had no legal rights to own property and producing offspring was their part of the deal. (BTW – the word “spinster,” which is still a legal term for unmarried woman, derives from women who spun cloth and were able to support themselves without a husband). Thinking about women’s choices in my own life, I reflect on my mother, my daughter and me. If my mother had the choices available to today’s women, she would likely have opted for a business career with no kids. That’s not to say she wasn’t a good mother – she loved and cared for her three kids the best way she knew how. She never took a job outside the home while we were growing up, even though the family could have used the extra income, because my father thought to do so would cast a negative perception on him and his earing capacity. Thank goodness my daughter, also a thirty-something, is free to choose her maternal destiny. As a social justice activist and a soon to be lawyer, she will likely forego motherhood to have the time, energy and focus to advance her many causes – including her belief that overpopulation is a real issue. As for me, ironically, I always thought I’d have a house full of kids. But things did not go that way. Due to divorce and early menopause, I only had one child, and as it turned out, one was probably my max capability. Having only one child, I was always somewhat apologetic. When asked about why, I would reply, “would have loved more but divorce got in the way” – changing folks’ perception of me from an ill-advised mother of an only child to a victim of circumstance. Had things been different, I would have had a hard time making a decision to have only one child – although I truly believe it turned out the best for both my daughter and me. My daughter loved being an only child and notwithstanding all the attention, she turned out to be an unselfish and well-adjusted person – a fact I take little credit for – she just came out of the chute this way. A young woman friend recently struggled over the “only-child” choice. She is a lawyer and her husband is a doctor – in many ways they are perfect parents with lots of love and means and good ethics. It was hard for her to decide to just have one – she worried her son would miss having siblings and that somehow her choice could permanently scar her son’s life. I tried to help her reconcile with her ultimate one child choice. But she, like many of us, had a built-in bias. In the old days if a family only had one child, the common belief was there was a medical problem preventing more. The women who wanted children and were not able to have them have their own stories of being judged and never quite accepted by their childbearing counterparts. I am beginning to understand how hard it must have been for them to listen to the non-stop baby/children growing up stories of most of their friends – since I am now experiencing the same phenomenon with respect to overly gaga grannies! You’d think they had nothing else of interest in their lives (I say with a bit of jealousy). A close friend who couldn’t have kids due to a medical condition made a comment that I found particularly poignant – something about having no one to leave all her photos to – thankfully today’s photos are mostly digital and can be disposed of by a click of a button – leaving no need for future offspring to be the recipient of those big boxes and random fading, curly-edged holiday, summer vacation and graduation family photos. (Ironically, I have a few such boxes and my kid has no interest). In looking beyond my own circle to get a sense of whether social mores regarding childbearing are changing, I googled the topic and found there have been numerous lively discussions within the last few years. On having one child, Lauren Sandler, author of “One and Only: The Freedom of Having an Only Child and the Joy of Being One” defends her position in an opinion piece in the NY Times Sunday Review (June 8, 2013). On having no children, Jill Filipovic writes in The Guardian (August 16, 2013) “Most of us grow up feeling that we should have children and that our lives will be unfulfilled without. We need new social norms”. In Choices (September 15, 2014) Julia Ma listed 25 celebrities, including Betty White, Oprah, Helen Mirren, Condoleezza Rice, Dolly Parton and Ellen who decided to forego children. The fact that people are talking about it, and many are staunch defenders of choice, leads me to think that the historical role of women as primarily baby-makers is changing – albeit slowly. If there is a message in these musings about the decision of motherhood or not, it is 2 fold: first, let us celebrate the fact that women finally have choice about their reproduction and second, let us not judge our sisters for the choices they make. In closing, I’d like to leave you with my list of 10 things NOT to say to women who chose to have no kids or only one. who is going to take care of you when you are old?